Lisa Dickinson (Blue Star Design on Scrapbook.com) did this great page in 2011 but I just saw it on Pinterest and fell in love with all the circle embellishments! Nichol Magourik is at it again creating a wonderful page full of diecuts from the new Simple Stories cuts available through the Silhouette online store - BONUS - there is a process video included in the post!! 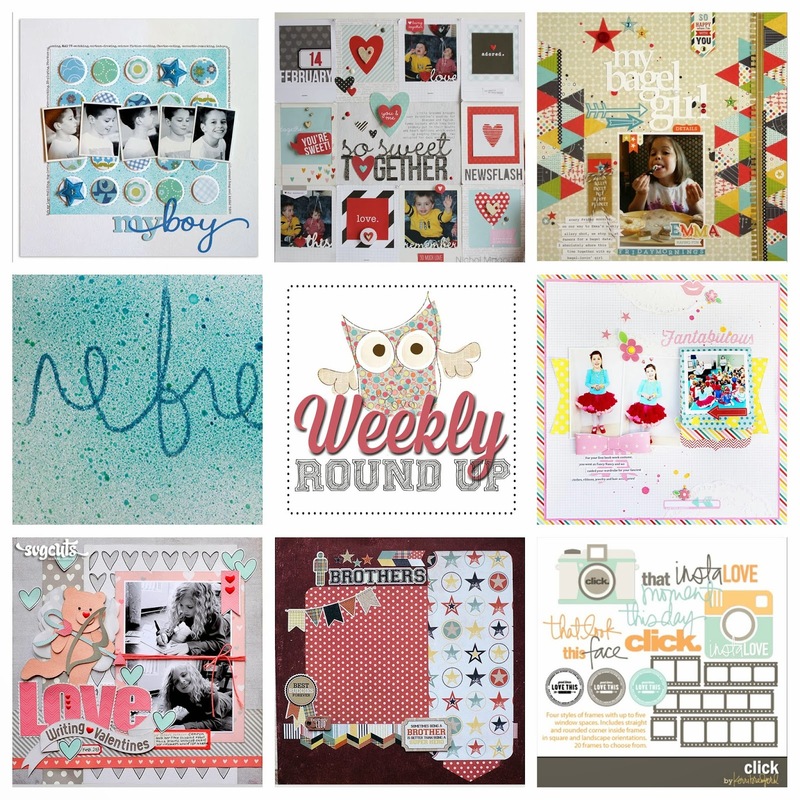 On the Echo Park blog designer Tania Willis shows how to use a "Boy Collection" for a girl layout. As an added bonus the sketch she used is featured here as well. 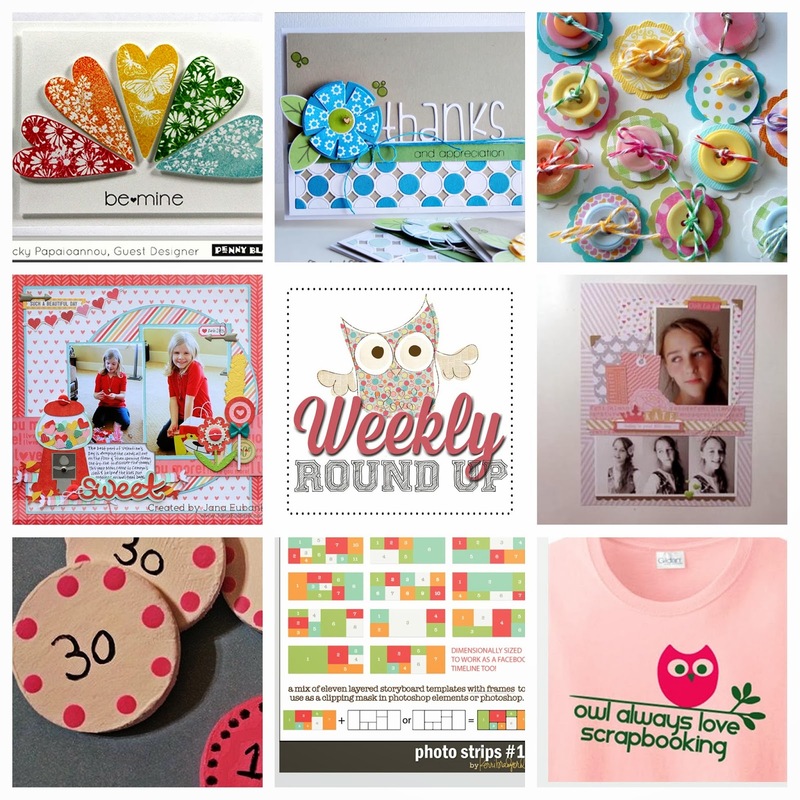 Scrapbook Steals is a fabulous resource to find deals on scrapbooking supplies. This week they also have a tutorial on their blog about how to turn your handwriting into a cut file! Gail Lindner is featured on the Pink Paislee blog showing an easy way to add more photos to your page without it becoming overwhelming. I also think this technique could be used to add some hidden journaling as well. 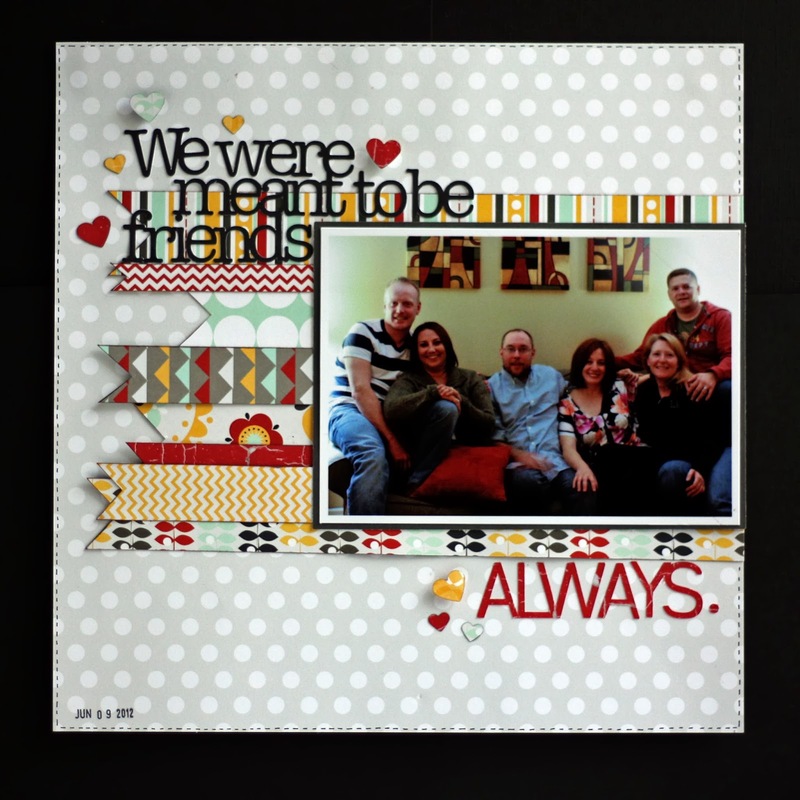 My new favourite scrapbooker, Jana Eubanks, has done it again with this gorgeous layout!!! DIYFabulous had this page layout for sale. While the page has been sold I'm sure I will scraplift her amazing layout on a page I do very soon. Kerri Bradford Studio has released another kit this week that I will be adding to my growing die-cut file library - immediately!! Fabulous! First up this week is this cute little card featured on the Penny Black site by one of my favourite artists Vicky Papaionnou. Nichol Magouirk shows how to make multiple cards with the same basic supplies but using different colours of ink and cardstock. Here's a super simple yet sweet embellishment idea from Papertreats Flickr stream. Jana Eubank has captured my heart yet again with this colourful layout featuring SVG Cuts files. This how-to video from Jennifer Gallacher uses one of the new lines from the new Chickaniddy Crafts. My daughter is only 4 so she doesn't watch a lot of tv but I spotted this idea and bookmarked it for the future! My favourite way to get lots of photos onto scrapbook pages is by using templates. Kerri Bradford is one of the best at creating cut files and photo templates. She has a new one out and I can't wait to buy it! Finally I spotted this t-shirt and considering the name of my Blog I think I'll have to pick this up before my next scrapbook retreat weekend!! This page came together pretty quick! I used a sketch from Scrapbook Generation and rotated it. The title came from the Silhouette online store and fit my photo perfectly! I used Fancy Pants Designs "The Good Life" Collection. The banners really helped maximize the paper in the collection. The inked the edges to make them stand out a bit more. The fabulous Laura Vegas does it again with this travel themed page featuring some die cuts by Kerri Bradford. Lisa Dickinson has created some cut & print files for Two Peas in a Bucket that are too cute to pass up! I love using photo collages on my scrapbook pages! I use Photoshop elements, however I know many don't have access to Photoshop or Elements but Picasa is a free program that you can use to create these collages. Creating Keepsakes has a great tutorial here. My Yellow Umbrella has a tutorial for handmade lotion soap that I can't wait to try! Page Maps is a great place for scrapbook layout sketches and if you use this sketch and submit a layout to them before February 23 you could win the February kit from Gossamar Blue!! 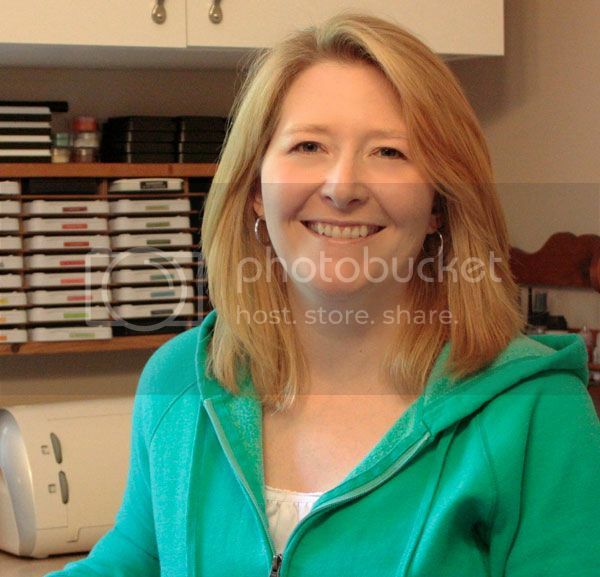 Amber from Damask Love creates the most amazing cards and paper projects. This cute cupcake tutorial is awesome. Sunburst backgrounds are still hot and this tutorial from Homespun Scrapbooking shows how to in an easy and straight forward way. 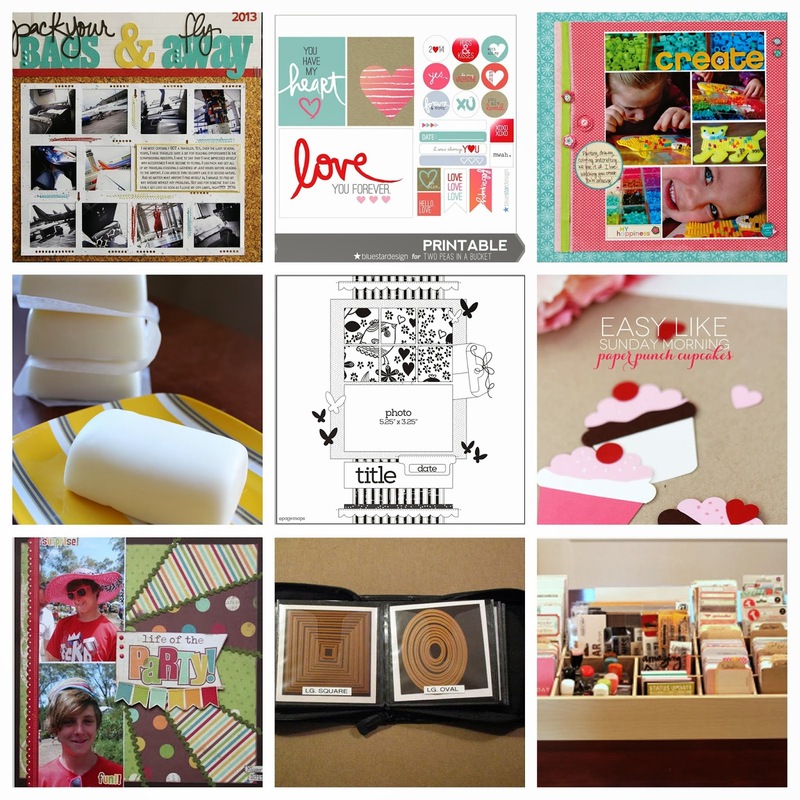 I'm always attracted to organizational tips and this idea on Scrapbook.com is one I will be borrowing. Cherie Bee has these super functional Pocket Page supply storage for sale at her Etsy shop. These snapshots were taken out on the back deck but the problem was the lighting! They were have in heavy shade/ half in bright sunshine! Oh well, you can't always pick where spontaneous moments are going to happen! The pink chicken wire patterned paper is from Jillibean Soup. But all other papers are from Pebbles' "Sunnyside" Collection The title card is from Pebbles' "Noted" Collection The 3x4 journal card is from My Mind's Eye Collectable "Unforgettable" Collection. The chipboard branch is from the Dollar Store and the little birds are cut out of a piece of Echo Park's "Hello Summer" paper. The whole layout is based on a sketch from Scrapbook Generation. ANGELA My love of paper and crafts can be traced back to elementary school art class and the love affair has only grown since then. A Hot Cocoa Kind of Day!